A partial federal government shutdown looms at midnight Friday, as the dispute over President Trump’s demand for $5 billion to complete the border wall with Mexico continues. 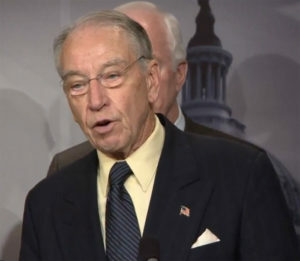 Iowa Senator Chuck Grassley, a Republican, says he backs the president’s goals to bolster border security. If there’s a partial government shutdown, three days before Christmas, it would be the third since Trump took office two years ago. Grassley says the political stalemate is unnecessary. As congressional leaders prepare to wrap up the session for 2018, Grassley says there’s no word on any pending deal with regards to paying for the wall, which was one of Trump’s key campaign promises. “I have heard nothing definitive except the standoff between Democrat Senate leaders and House leaders and Democrats — and the president’s position,” he says. Grassley notes, there’s already some 650 miles of wall built along the 2300 miles of border between the U-S and Mexico. He adds, improvements are needed along parts of the existing wall and much more construction is needed. “There also needs to be electronic surveillance, more border patrol, doing away with the catch-and-release policy, having more internal enforcement,” Grassley says. While the president has requested $5 billion for the border wall, other estimates find that completing the project may cost considerably more, ranging from $15 billion to $70 billion. A report from the Department of Homeland Security estimated finishing the wall would cost $21.6 billion.